‘One night we were journeying in the west of the Rockies over a road bed which threatened to jerk out our teeth with every loosely-laid sleeper on the line. ‘Travelling in that part of the world, certainly in …the days I speak of, was pretty hard. The travellers were mostly men, all over-worked, all over-anxious, and intolerant of anything which hindered their work or interfered with the measure of their repose. In night journeys the berths in the sleeping cars were made up early, and as all the night trains were sleeping cars, the only thing to be done was to turn in at once and try and sleep away the time. As most of us were tired out with the day’s work, the arrangement suited everybody. ‘The weather was harsh; sneezing and coughing was the order of the day. This made the people in the sleeper, all men, irritable: all the more that as most of them were contributing to the general chorus of sounds coming muffled through quilts and curtains, it was impossible to single out any special offender for general execration. After a while, however, the change of posture from standing or sitting to lying down began to have some kind of soothing effect, and new sounds of occasional snoring began to vary the monotony of irritation. Presently the train stopped at a way station; then ensued a prolonged spell of shunting backwards and forwards with the uncertainty of jerkiness which is so peculiarly disturbing to imperfect sleep; and then two newcomers entered the sleeper, a man and a baby. The baby was young, quite young enough to be defiantly ignorant and intolerant of all rules and regulations regarding the common good. It played for its own hand alone, and as it was extremely angry and gifted with exceptionally powerful lungs, the fact of its presence and its emotional condition, even though the latter afforded a mystery as to its cause, were immediately apparent. The snoring ceased, and its place was taken by muttered grunts and growls; the coughing seemed to increase with the renewed irritation, and everywhere was the rustling of ill-at-ease and impotent humanity. Curtains were pulled angrily aside, the rings shrieking viciously on the brass rods, and faces with bent brows and gleaming eyes and hardening mouths glared savagely at the intruder on our quiet, for so we now had tardily come to consider by comparison him and it. The newcomer did not seem to take the least notice of anything, but went on in a stolid way trying to quiet the child, shifting it from one arm to the other, dandling it up and down, and rocking it sideways. ‘I took considerable amusement, myself, from the annoyance of my fellow-passengers. I had no cold myself, and so had been worried by their discomforting sounds; besides, I had come to the car from a dinner with clients, where the wine of the country had circulated with quite sufficient freedom. When a man has a large family – I regret to say that at that time my first wife was nursing her seventh – he acquires a certain indifference to infantile querulousness. As a matter of fact, he does not feel sympathy with the child at all, his pity being reserved for other people. ‘All babies are malignant; the natural wickedness of man, as elaborated at the primeval curse, seems to find an unadulterated effect in their expressions of feeling. ‘This baby was a peculiarly fine specimen of its class. It seemed to have no compunction whatever, no parental respect, no natural affection, no mitigation in the natural virulence of its rancour. It screamed, it roared, it squalled, it bellowed. The root ideas of profanity, of obscenity, of blasphemy were mingled in its tone. It beat with clenched fist its father’s face, it clawed at his eyes with twitching fingers, it used its head as an engine with which to buffet him. It kicked, it struggled, it wriggled, it writhed, it twisted itself into serpentine convolutions, till every now and then, what with its vocal and muscular exertions, it threatened to get black in the face. All the time the stolid father simply tried to keep it quiet with eternal changes of posture and with whispered words, “There, now, pet!” “Hush! lie still, little one.” “Rest, dear one, rest!” He was a big, lanky, patient-looking, angular man with great rough hands and enormous feet, which he shifted about as he spoke; so that man and child together seemed eternally restless. 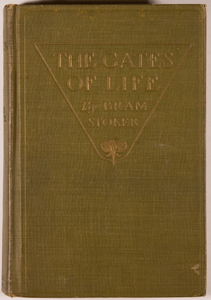 When The Man was published in the US the title was changed to The Gates of Life. The voice of the speaker sounded clearly through the hawthorn tree. The young man and the young girl who sat together on the low tombstone looked at each other. They had heard the voices of the two children talking, but had not noticed what they said; it was the sentiment, not the sound, which roused their attention. The girl put her finger to her lips to impress silence, and the man nodded; they sat as still as mice whilst the two children went on talking. The scene would have gladdened a painter’s heart. An old churchyard. The church low and square-towered, with long mullioned windows, the yellow-grey stone roughened by age and tender-hued with lichens. Round it clustered many tombstones tilted in all directions. Behind the church a line of gnarled and twisted yews. The churchyard was full of fine trees. On one side a magnificent cedar; on the other a great copper beech. Here and there among the tombs and headstones many beautiful blossoming trees rose from the long green grass. The laburnum glowed in the June afternoon sunlight; the lilac, the hawthorn and the clustering meadowsweet which fringed the edge of the lazy stream mingled their heavy sweetness in sleepy fragrance. The yellow-grey crumbling walls were green in places with wrinkled harts-tongues, and were topped with sweet-williams and spreading house-leek and stone-crop and wild-flowers whose delicious sweetness made for the drowsy repose of perfect summer. But amid all that mass of glowing colour the two young figures seated on the grey old tomb stood out conspicuously. The man was in conventional hunting-dress: red coat, white stock, black hat, white breeches, and top-boots. The girl was one of the richest, most glowing, and yet withal daintiest figures the eye of man could linger on. She was in riding-habit of hunting scarlet cloth; her black hat was tipped forward by piled-up masses red-golden hair. Round her neck was a white lawn scarf in the fashion of a man’s hunting-stock, close fitting, and sinking into a gold-buttoned waistcoat of snowy twill. As she sat with the long skirt across her left arm her tiny black top-boots appeared underneath. Her gauntleted gloves were of white buckskin; her riding-whip was plaited of white leather, topped with ivory and banded with gold. Even in her fourteenth year Miss Stephen Norman gave promise of striking beauty; beauty of a rarely composite character. In her the various elements of her race seemed to have cropped out. The firm-set jaw, with chin broader and more square than is usual in a woman, and the wide fine forehead and aquiline nose marked the high descent from Saxon through Norman. The glorious mass of red hair, of the true flame colour, showed the blood of another ancient ancestor of Northern race, and suited well with the voluptuous curves of the full, crimson lips. The purple-black eyes, the raven eyebrows and eyelashes, and the fine curve of the nostrils spoke of the Eastern blood of the far-back wife of the Crusader. Already she was tall for her age, with something of that lankiness which marks the early development of a really fine figure. Long-legged, long-necked, as straight as a lance, with head poised on the proud neck like a lily on its stem. Stephen Norman certainly gave promise of a splendid womanhood. Pride, self-reliance and dominance were marked in every feature; in her bearing and in her lightest movement. Her companion, Harold An Wolf, was some five years her senior, and by means of those five years and certain qualities had long stood in the position of her mentor. He was more than six feet two in height, deep-chested, broad-shouldered, lean-flanked, long-armed and big-handed. He had that appearance strength, with well-poised neck and forward set of the head, which marks the successful athlete. The two sat quiet, listening. Through the quiet hum of afternoon came the voices of the two children. Outside the lich-gate, under the shade of the spreading cedar, the horses stamped occasionally as the flies troubled them. The grooms were mounted; one held the delicate-limbed white Arab, the other the great black horse. The little girl who made the remark was an ideal specimen of the village Sunday-school child. Blue-eyed, rosy-cheeked, thick-legged, with her straight brown hair tied into a hard bunch with a much-creased, cherry-coloured ribbon. A glance at the girl would have satisfied the most sceptical as to her goodness. Without being in any way smug she was radiant with self-satisfaction and well-doing. A child of the people; an early riser; a help to her mother; a good angel to her father; a little mother to her brothers and sisters; cleanly in mind and body; self-reliant, full of faith, cheerful. “The World’s Greatest Ship-Building Yard” was a nonfiction article by Bram Stoker. It was first published in the May 1907 issue of The World’s Work: An Illustrated Magazine of National Efficiency and Social Progress, William Heinemann, London. 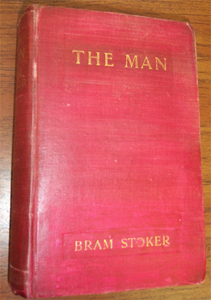 “To the Rescue” is a very short story by Bram Stoker. 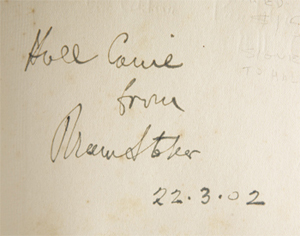 It was first published in the UK in the April 22, 1908 issue of the Westminster Gazette, London. It was republ…ished for the first time in over 100 years under the title ‘Bram Stoker’s “Lost” Sketch: “To the Rescue” in the 2014 Vol. 57 No. 3 issue of English Literature in Transition 1880-1920, ELT Press, Greensboro, NC.